Ahhh, Doctor Who, the musical, what could go wrong? Well, the BBC could send a cease and desist notice to the performers an hour before the show starts, causing a mad re-write to ensure copyright is not infringed. The sets could be as shoddy and wobbly as the 70s TV show and none of the special guests could turn up. So it’s a complete joyful relief that this is such a fun experience. If you are a fan of the Doctor and you do not see this tribute to all things Who at the festival, then you are letting yourself down very badly. The entire cast consists of Jamie Wilson and Jess Spray, (plus an excellent keyboard player), and they are brilliant. Jess plays The Assistant (good scream and excellent depiction of a girly sci-fi nerd), while Jamie plays everyone else. The songs woven throughout the performance are perfect for all you Whovians out there (and there is a CD available for just £3 after the show). Both have very good singing voices, and there is a constant stream of references for the fans from the first 1963 episode on, as well as a couple of really cool props. I Need A Doctor: The Whosical is a re-working of the show they took to the Fringe last year (which I somehow missed). 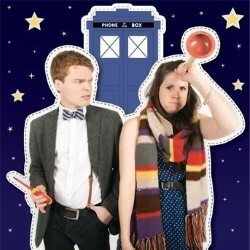 The show is choc-full of music and jokes and action and laughs and will delight any fan of any incarnation of Dr Who. I Need A Doctor: The Whosical is on at Pleasance Courtyard.